Aurora Flight Sciences, American aviation & aeronautics research company specialized in designing unmanned aerial vehicles have teamed up with 3D printing company Stratasys to develop the world’s first 3D-printed jet-powered aircraft. Unveiled during an exhibition at the Dubai Airshow, the drone is believed to be the fastest 3D printed UAV as well with an astonishing top speed of 150 miles per hour. Also, according to Dan Campbell, Aurora Flight Sciences’s Aerospace Research Engineer, it is also the largest and most complex 3D-printed UAV ever produced. Weighing only 33 pounds, the drone is assembled using 80% 3D-printed parts and has a large wingspan of 9 feet. The 3D printing technology helped researchers reduce the weight of the aircraft and also cut the build time by half. With such a fusion of 3D printing with aviation technology, developers can create mission-specific aircrafts in a small budget and very less time. A special strong and lightweight material called ULTEM was used in the manufacturing process. Ideal for aerospace applications, the material meets the flame, smoke, and toxicity requirements set by the FAA. 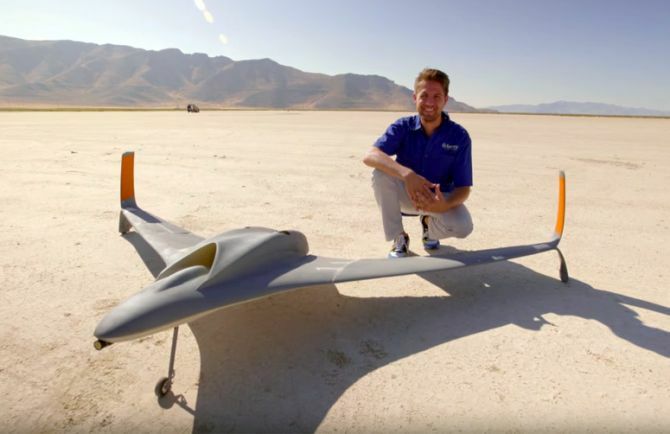 Checkout the video below in which the world’s first Jet-Powered, 3D-printed UAV is gliding at a top speed of 150 miles per hour.